Derek’s artistic expression formed at an early age staying up late building entire cities with Legos. This, combined with his interest in art, caused him to declare (at age five) that he wanted to be a "draw-er" when he grew up. This vision for Derek's future was, however, slightly altered during his teen years. Even though he grew up only a stone's throw from the beach in Los Angeles, he shunned the obvious choice of surfing for the East Coast pleasures of Ice Hockey and Lacrosse. It was in these team-oriented sports he learned the art of collaboration. This, combined with his graphic artistic abilities, led him to the career path of architecture. Besides, there is no such career as a "draw-er", but don't tell Derek. Attending USC's School of Architecture proved pivotal in many aspects of Derek's life. He spent a semester studying architecture in Italy, where he spent numerous days sketching and discovering how the sophisticated urban environment of many of Italy's cities created a quality of pedestrian life in the street that is rarely found back in the States. To this day, one of his goals is to utilize design to improve the pedestrian experience on the street. 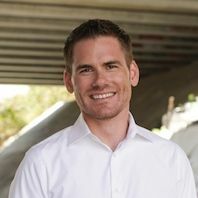 And as he often says, "No city needs this more than Los Angeles.” Out of school, Derek spent six years working for three different architecture firms, fine tuning his technical and management skills before co-founding the architecture firm Modative in 2006. As it turns out, some of Derek's earliest interests in getting things built (the Legos) and collaboration (team sports) remain alive as some of the core founding principles at Modative. In the last few years, Modative has established itself as a leading expert in Los Angeles’ innovative residential small lot subdivision ordnance, providing the firm with a steady flow of work and influence over the future of development in Los Angeles. In recent years, Modative co-founders Christian Návar and Derek Leavitt have ventured beyond their architectural practice to forming construction and development companies, becoming a one-stop-shop for designing, developing and building their projects.